Rudolph (Malus 'Rudolph') has one of the largest single pink flowers on any crab apple variety and is simply stunning when in full bloom. Apparently the name comes from the Reindeer of the same name with the red nose. We think this might be because the aforementioned Reindeer might be alcoholic but who are we to judge. 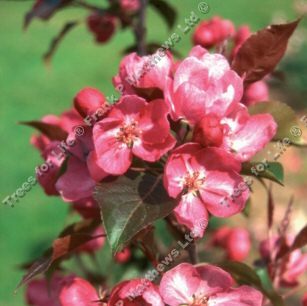 Malus Rudolph aka Rudolph Crab Apple tree is also known to have a good level of disease resistance. By that we mean diseases associated with crab apple trees and not the Plague, Ebola, Cancer, AIDS etc. Trees Online accept no responsibility for any health workers turning up at appointments with the Rudolph crab apple tree expecting it to protect them from human illness. The fresh purple-green leaves during the season also makes this a good summer tree. The fruits are small, dark purple and persistent. First introduced in Canada. This tree is supplied at a height of between 1.5 and 2.0 metres in a 12 litre container for year round planting and better results than from either bare-root or rootballed stock.